Nearing the end of my backlog has given me more time to revisit some of my favorite evergreen games lately. 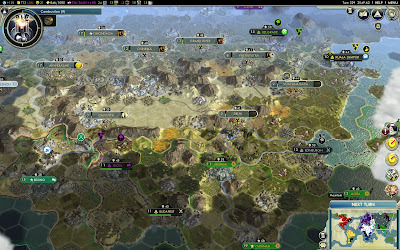 The other night I jumped into Civ V and played "just one more turn" for a few hours. I haven't played much Civ in awhile but the strategy and flow of the game came back almost immediately. In the moment everything was fine, but reflecting on the game after I had finished I realized that I didn't get much out of it. I feel like I understand everything Civ V has to show me. I'm no longer getting anything out of this game. So, I deleted it from my hard drive. I'm done with Civ V for the foreseeable future. I guess it's not an evergreen game for me anymore. But that's ok, it provided me with many hours of entertainment over many years. It was a good game, but it seems like I'm ready to move on. I am kind of curious to try Beyond Earth again with the expansion, but I haven't been in a Civ mood since it came out. That's a good thing. I value my free time a lot more these days! I think they would need to make radical changes to Beyond Earth to get me back into it. It never clicked with me at all.